Whiplash is a relatively common injury sustained from car accidents, especially in rear-end accidents. While it can seem like a minor claim, the effects of whiplash can have a tangible impact on your daily life. By contacting personal injury lawyers, you may be able to file an auto accident injury claim to receive compensation for medical expenses and other damages. Follow these tips to pursue a personal injury case involving whiplash as soon as possible after the accident. At times, the symptoms of whiplash do not appear for hours or days after the accident, as your body's release of adrenaline and cortisol afterward may mask the symptoms. Regardless of if you think you need medical attention or not, it is always a good idea to see a doctor following an accident, as they'll be able to see signs of an injury right away. And when you get whiplash diagnosed immediately, judges, juries, and insurers will take the claim more seriously. Otherwise, they tend to look at whiplash injuries as a false claim to try and get money. Once you've gotten your case of whiplash documented by medical professionals, start the claim process. Contact your insurance carrier if you live in a no-fault state. If you are in a state that permits suits for personal injuries after an auto accident, notify the other driver's insurance company in writing of your injuries and ensuing claim. Contacting personal injury lawyers right after the accident is essential. While 95 to 96% of all personal injury cases are settled pretrial, you will need someone to represent you if it goes to court. 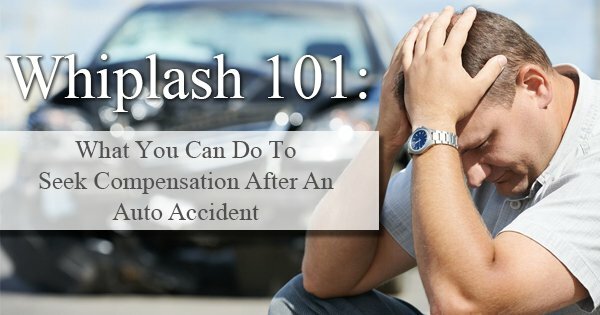 As the specifics of personal injury law vary between jurisdictions, consulting an attorney right away will give you an idea of what compensation you are entitled to, and how to pursue the case if necessary.If you are in an auto accident, do not hesitate to seek compensation through a lawyer. Medical bills and the pay you miss when you cannot go to work can majorly impact your financials, and you deserve to have that made up to you.